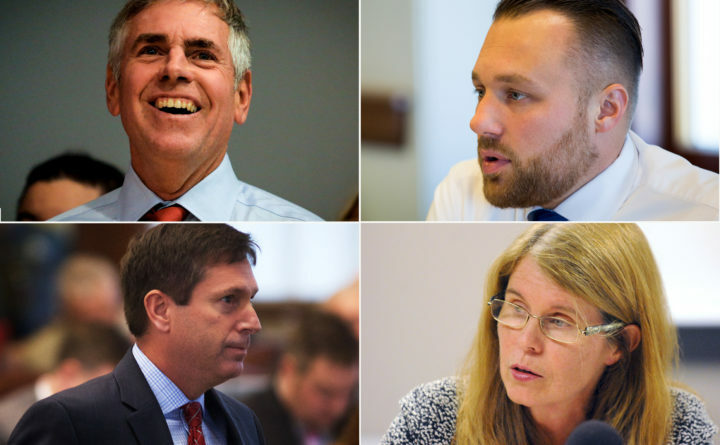 Republican candidates for governor, from top left, Shawn Moody, Garrett Mason, Mary Mayhew and Ken Fredette. This year’s Maine gubernatorial primaries highlight the pitfalls of our increasingly divided government and society. It has long been true, for both political parties, that primary elections draw the most strident party voters. This year’s Republican primary for governor, to replace term-limited Gov. Paul LePage, is an extreme example. All four candidates are racing to the right, portraying themselves as the best person to replace the divisive governor. The Maine GOP has also tilted to the far right. At their convention earlier this month, Republicans adopted a platform that would move Maine backward by restricting marriage rights, continuing to oppose the national monument that is drawing visitors and their dollars to rural Maine, and further restricting abortion. There apparently is no place in today’s Republican Party for lifelong Republicans who not only support true fiscal responsibility (not passing unpaid tax cuts for the wealthy) and smaller government, but also believe women should make their own health care choices, immigrants boost our economy and enrich our communities, and Second Amendment rights are compatible with common-sense restrictions on firearm sales. Republicans who understand the need for a temporary helping hand and who believe in equality, especially for our LGBT friends, family and neighbors, have been shut out of the GOP. As a result, there are no good choices for reasonable, moderate Republican voters in the June 12 primary. Mary Mayhew, who served as commissioner of the Maine Department of Health and Human Services under LePage, makes a case for an effective government based on setting clear priorities and measuring outcomes based on data. This may sound compelling, but while Mayhew oversaw the department, this meant that as aid to poor families was cut, hunger increased. It meant the state’s public mental health facility lost its federal accreditation, risking the millions of dollars that came with it. It meant that the department failed to investigate a single one of the 133 deaths of people with developmental disabilities while under the care of community-based providers, as was required under an agreement with the federal government. It meant thousands of calls to a child protection hotline went unanswered and that an attempt to strip health coverage from young adults was reversed by court order. Even when Mayhew tried to tout the supposed success of her assistance-cutting policies in putting people to work, the results didn’t show that people were better off. Ken Fredette, the Republican leader in the Maine House of Representatives, is best known for shutting down state government. In an early April debate, he touted his leadership, citing his negotiations with Democrats to resolve disagreements. Just weeks later, he convinced his Republican colleagues to end the legislative session, despite reams of unfinished business, rather than negotiate a resolution with other legislative leaders. Maine has had enough of this “government by threat” in the last seven-and-a-half years under LePage. Garrett Mason, the Senate majority leader, is the only candidate in this race with a consistent record of conservatism. This makes him a solid choice for truly conservative voters. But his restrictive views on marriage, abortion and immigration are cause for concern. He is using money from Maine’s Clean Election fund to run his campaign, but has voted against this funding in general. That leaves Shawn Moody, owner of a car repair business in southern Maine. Moody ran as an independent candidate for governor in 2010 and only recently joined the Republican Party, raising questions about where he stands on important issues, such as health care, social services and economic development. In debates and interviews, he has been short on details, and sometimes contradictory. While he has some LePage staffers, including the governor’s daughter and political adviser, on his payroll, his style is much different from the current governor’s. His company, Moody’s Collision Center, is employee owned, showing that he can be an inclusive leader who seeks information and ideas from others. His emphasis on education, especially vocational education, as both a pathway out of poverty and an important tool in growing Maine’s trained workforce can be a foundation for other state entities and for other partnerships between the state and private businesses. Likewise, his proposal to learn what state policies are helping and which are hurting businesses can be an important step in a more thoughtful assessment of how to grow the state’s economy. Among this disappointing slate of candidates, Moody is a worthy contender for Republicans’ top ranking on the June 12 ballot.